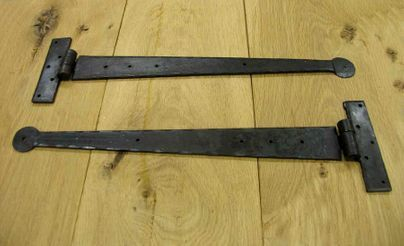 Our T Hinges have been crafted by hand in the Traditional way of English Blacksmithing. This is a process known as Hand Forging. Each T Hinge will never be exactly the same as another, which is a characteristic lost in modern mass production. Charming, Authentic and Rustic. Available in Four Lengths. We recommend the 8" and 12" T Hinges for Cupboard use and a minimum Length of 15" required for Ledge & Brace Doors. Due to the Nature of Hand Forging, all sizes are approximate.